While I was working on some of the numbers for our game project Desiderata, I reached a point where damage variance came into question. How much variation presented too much randomness, for example. 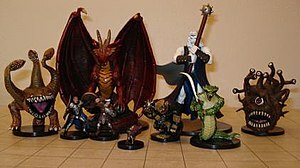 I looked to Dungeons & Dragons for examples, since it’s the system with which I have the most experience. When you’re working with really small numbers, like the results you can reasonably expect from a six- or ten-sided die, it’s really easy too look at a variation of 50-100% in damage with only a few numbers difference. If the average damage on a dee-ten is five for example, you know the maximum damage, ten, is twice that much. By comparison, two-to-three is half that much, and you can easily see how a weapon ability like “Brutal” (reroll any result of 1 or 2) might be implemented to counteract the swinginess of the dice. Rolling a one on a dee-ten results in more than a one-half reduction in damage output — it’s far closer to eighty percent, nigh unplayable. Of course, the special effects can distract you from the fact that each critter has hit points and can therefore be killed. What do you do? How do you manage damage variance? I talk about health and hit points as a game resource so often that it stops looking like a conversation about hit points as a game resource. I know because sometimes I forget what I’m talking about and it feels like this big deal to come back to the issue and go, “oh yeah, this is about hit points!” Hit points are pawns, as in Chess. Every action your character takes should be measurable in material (or estimable), or hit points. Your attacks should be worth about one-third your opponent’s total health — um, which is a number I decided on my system for the sake of simplicity and speed. It’ll be different elsewhere. Defeat your opponent before you run out of material. I think the main downside I see — by which I mean the part where the Chess analogue breaks down, is that in Chess, it’s difficult to immediately attack your opponent. There’s this whole opening period where you’re creating defensive positions generally with fewer attacks, and gambits here and there to attempt an early lead. There’s less of that in a tactics-heavy game like D&D, and by extension, most of the RPG genre that includes fighting. Mostly you have the characters rushing into the confrontation with limited setup, though ranged-attack characters (reminiscent of rooks and bishops) might soften up the enemy before the initial charge begins. What is each hit point worth? I understand the perception that only the last hit point matters. I get that, and it’s a viable playstyle in a variety of strategy games. But it isn’t the only way to play, and it isn’t necessarily the best way to play either. Each of those hit points represents something, and each one lost represents the loss of something. Just as it becomes more and more difficult to win a game of Chess the fewer pieces you have to work with, the less likely victory seems when your hit points dwindle — they may only reflect the amount of time you have before you lose, but they all count toward your resources. Each hit point a pawn in the grand strategy.